Patrick Süskind’s novel ‘Perfume’ has to be one of my all time favourite books (I have popped my top 40 back on the blog though it seriously needs updating) and one that I think I have read at least twice maybe three times, the first back when I was in my late teens and the tale still haunts me now. Rather naively of me I thought he hadn’t written anything else, rather like Arundhati Roy – hurry up with a new one please, until I was perusing my mothers endless bookshelves when I went for a visit and found (and borrowed) his novella ‘The Pigeon’. ‘The Pigeon’ is a strange little tale in many ways. In only 77 pages Süskind gives you a rather unusual and momentous day in the life of Jonathan Noel. What makes this work all the more is that in the first five pages you have pretty much been given his life, which equates to his parents vanishing, living with horrid relatives, serving for the army and then having thirty years of the utterly mundane and simply working to eat and by a room with a shared toilet in Paris. That is until the day a pigeon is sat on his doorstep as he tries to go to the bathroom, something that causes Jonathan to have a complete nervous breakdown, to both comic and emotional extremes, which seems to have been waiting to happen for forty or so years. I don’t want to say any more as being a novella my review could easily go on for as long as the book and I don’t want to give anymore away. I will say as Jonathan’s day slowly got worse I found myself both laughing more and worrying more all at once. I also really empathized with him because of how Süskind writes his emotions and frustrations. When he rips his trousers you are completely there with him, you know how it feels – the humilation, the anger at the trousers and then at yourself, it’s very well done. I couldn’t compare it to ‘Perfume’ but then I wouldn’t want to. I don’t think you can compare any two works of one author especially when one is as successful as ‘Perfume’. 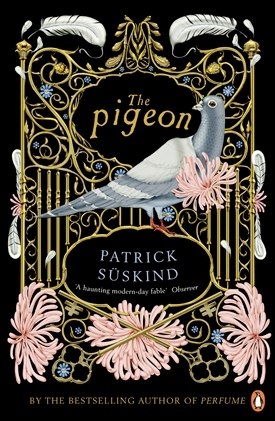 I can say that ‘The Pigeon’ has reminded me why I love Perfume so much, Süskind can put you into the mind of people who at first seem ordinary and show you all their quirks, he cam also take you to beautiful cities like Paris and darken them with his words without making anything grandly gothic or overdone. It will also have you wondering what small incident or happening could change your life forever. Has anyone else read ‘The Pigeon’? Who also loves ‘Perfume’? Which other books by Süskind have any of you read?